London based jewellery designer Mikey specialises in unique, wearable glamour for all occasions. 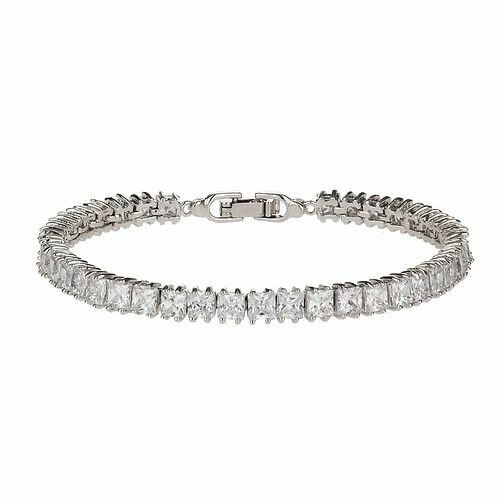 A jewellery box classic, this glittering square cut crystal tennis bracelet is styled in shining rhodium plate for a fresh, contemporary feel. Mikey Rhodium-Plated Square Cut Crystal Tennis Bracelet is rated 4.0 out of 5 by 1. Rated 4 out of 5 by Anonymous from Sparkly with a good clasp Although this isn't adjustable for someone like my daughter, who has small wrists, she loves it. Because it is square and chunkier than some sparkly bracelets, it's good with informal clothes as well as party clothes. My daughter says it feels nice and doesn't catch on anything like tights, which some rings and bracelets do. She can put it on without help as the clasp is large enough. The website was easy to use and the bracelet arrived promptly. My only regret is that I can't use the £25 voucher that came with it as I can't find anything for £75 that I can justify buying for myself. Only time will tell for sure about the quality. I hope it stays sparkly and that nothing comes off it.